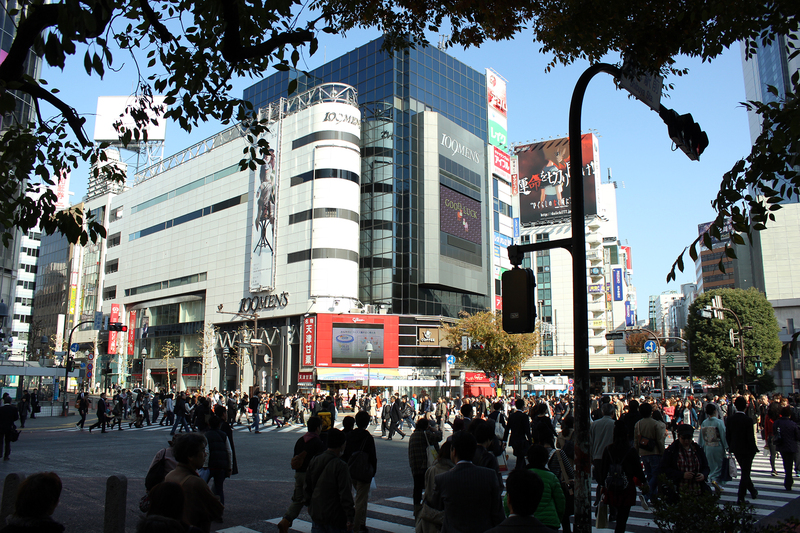 In the autumn of 2013 I travelled through Japan for two weeks. 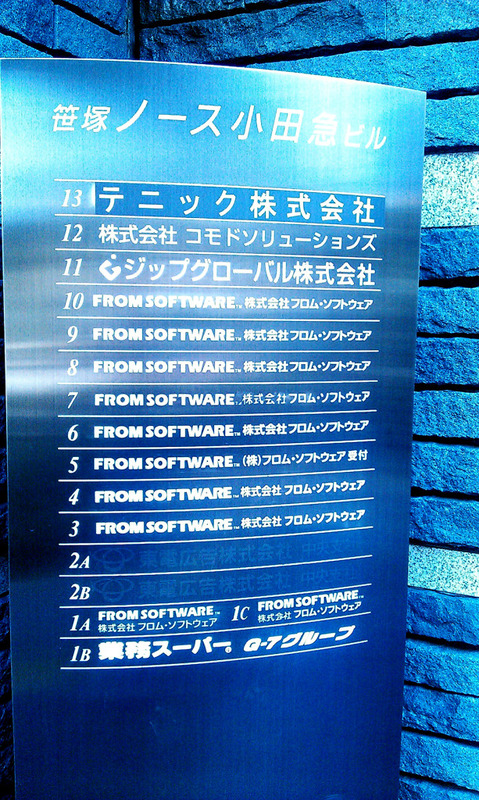 I had various cities and temples on my list of places to visit and one very peculiar destination, the FromSoftware studio. I am a fan of Dark Souls. It is my favourite game. It is a work of art that I have spent hundreds of hours looking at, contemplating, and experiencing. Dark Souls 2 was about four months away from getting released and I wanted to see if I could get a look behind the scenes, play a demo, or find out anything at all about the sequel. I’m not a journalist and, at the time, Game Crusaders didn’t even exist yet. I didn’t make an appointment. I just went there hoping to make it inside. With the studio hidden in one of Tokyo’s suburbs, it took some effort to find out where I needed to be. The hostel staff did their best to Google-map me in the right direction and with a piece of paper full of notes, train numbers and time tables I jumped on a train. My adventure began with a bunch of train rides. From the station I kept my eyes open for anything that could hint at the studio’s location. When I finally noticed the small and subtle signs outside a very neutral office building, I had to take a minute or two to gather enough courage to enter. There was no doorman, no reception. The doors slid open and I stepped inside. The long hallway held a couple of people waiting for elevators. They gave me a quick glance and must have wondered what this Westerner was doing here. The confused look on my face must not have helped either. As the employees got on the elevators, I walked through the hallway and found out there was nothing on this ground floor. I had to go up, but the sign indicating the departments and floors was in Japanese only. I contemplated picking a random floor. I must have stood there for a couple minutes. I didn’t know where to go and I was getting nervous. This was the only helpful sign I came across. Then an employee walked by, looking at me like he was sure I didn’t belong here. “Are you looking for something?” he asked. I was glad he spoke English – a not-very-common feat in this country. I explained that I came from the Netherlands, am a big fan of Dark Souls, and that I write for a blog. I don’t even know why I said that as I don’t think my personal travel blog I was writing at the time really counts. Either way, the guy was not impressed when I told him I had no appointment whatsoever and even less when I asked him if I could get a tour or play a demo by any chance. He was a fairly young guy and worked in the community and social media sector of the company. He was nice, but unfortunately most of my questions were answered with a no. There was no demo to play, no look behind the scenes possible, and I was not allowed to meet any artists or developers working on the game. Eventually, he decided to check with someone from the PR department to see if anything could be arranged. 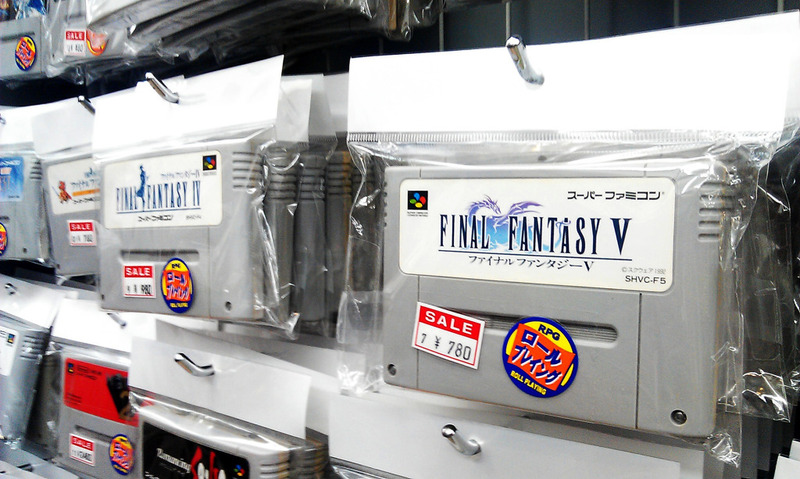 Wandering around Tokyo’s game stores is a real treat for any gamer. The community and social media man went up the elevator and I had a moment to breathe and think about how I could squeeze anything out of this. After about 10 minutes the guy came back with a sharply dressed man from the PR department. This is where things got formal real quick; I was introduced, hands were shaken and bows were made. The PR man did not speak English and the community guy stayed with us to serve as a translator which gave the meeting an even more formal vibe. The PR man handed me a leaflet with a quick overview of FromSoftware’s portfolio and biography and welcomed me to the building. I had to awkwardly explain once again that I did not have an appointment, but was kind of a “writer”- trying my best to sound like more than just a fan. The tables seemed kind of turned as the unannounced visit and request for an interview made the PR man a little nervous this time around. He agreed to do the interview, but I was immediately informed that there was very little he was allowed to say about the upcoming Dark Souls 2. But with that victory I made it from the hallway into the elevator. 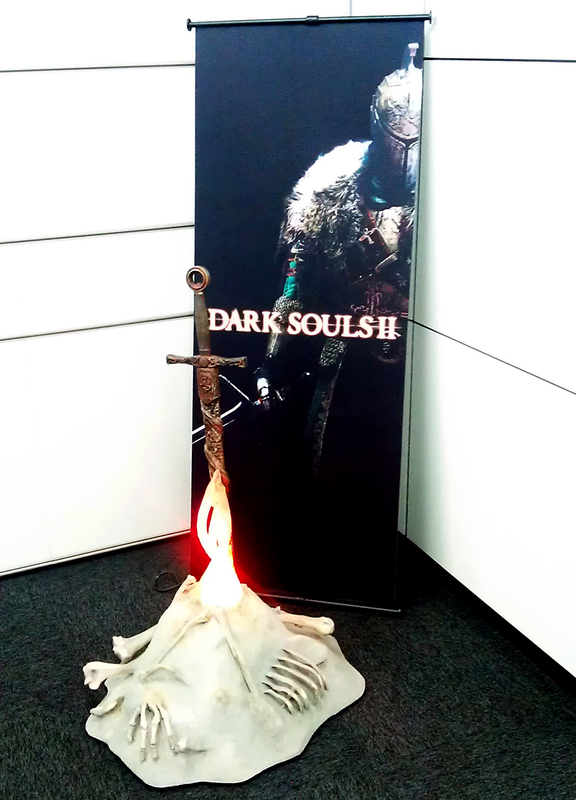 We arrived at the office floor where Dark Souls 2 was being made at that very moment. Right outside the elevator we were greeted by a bonfire with a Dark Souls 2 poster. The actual workspace was fenced off by typical office cubes and the two men respectfully explained that, while we were on the floor, we were not allowed to enter the workspace. It was time to come up with a couple of questions on the fly. The bonfire – a very iconic sight for any Dark Souls fan, myself included. As I was already told, they could not tell me anything about the game so I decided to ask some less formal questions. First up I asked about their fans, what kind of fanmail they had gotten, and how they feel about their dedicated fan base. Surprisingly, while they love having fans, they also receive a lot of bad messages from the community about patches, flaws in the game and demands for fixes. The community man said it’s those comments that usually stick in their minds more because they want to deliver a great game and negative feedback is hard to receive after all their hard work. When I asked whether they still played the first Dark Souls themselves, the answer was also a surprising “no”. Coincidentally, this led them to reveal that, while they did not work in the development department, they would occasionally be asked to playtest games the company is working on. That meant they had played through the original game multiple times before it was even released. 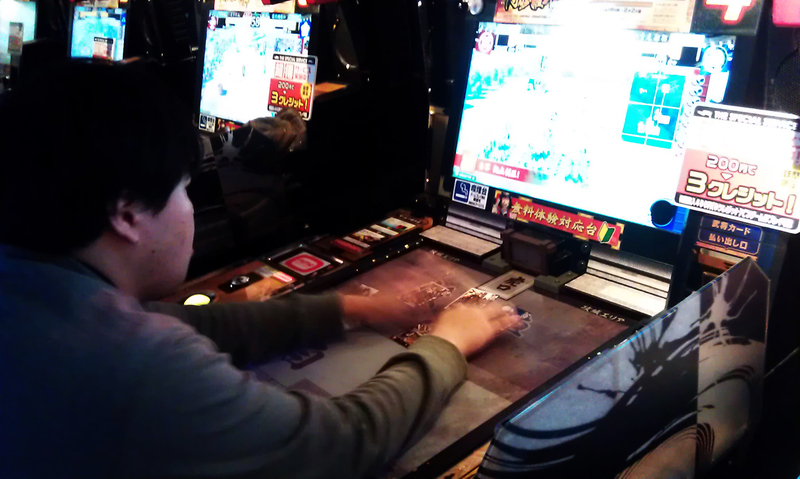 Walking into one of the many arcades in Tokyo is a must. The people, games, and overall vibe is sublime. Last, but not least, I asked what happens when the studio releases a big game like the upcoming Dark Souls 2. “There will be a party” was the answer, “probably at the publishers office maybe?”. Both interviewees were rather surprised by this question, but I was content with having cracked a smile out of them and losing the formality. As we wrapped up hands were shaken once again and bows were made as we started our journey back to the ground floor. While I didn’t find out anything about the game I was hoping to see, I left the studio feeling very content with having made it that far. Even though the interview was kind of strange, I am still stoked on the thought that this bold move turned out to be my first successful international video gaming interview. I hope there will more to follow. Hey man great review of your trip! Hope you had a lot of fun in japan. 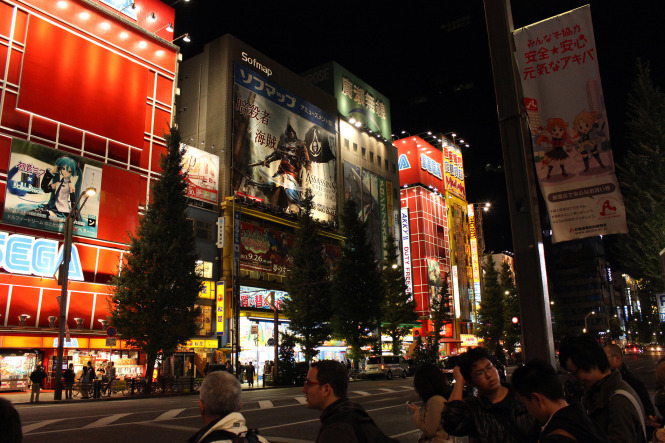 I am and artist studying abroad this year between july and august and will be in Tokyo, Japan and seriously want to visit fromsoftware as the Dark Souls series is one of my favorite of all time. Is it possible you could give me some tips on finding the place,what to do when im there and maybe even some direction?